Speakers, panels and career development sessions offer professional development and a great environment to build relationships. Come to BWF's Members only Spring Networking event. Light appetizers and Wine included. Wednesday, May 22nd, 2019, 11:30 a.m. - 1:00 p.m.
Professional presence and brand will always be an important determinant of career growth; however, it can be tricky to navigate the right presence to hold at various stages of careers. The program will be hosted at the offices of Highland Financial Group, 93 Worcester Street, Wellesley, MA. Registration and networking will be hosted from 11:30 a.m. - 12:00 p.m., and our program will run from 12:00 - 1:00 p.m.
To register for this program, please complete the form to the left. Tickets are $15 for BWF members, and $30 for non-members. Your lunch is included in the price of your ticket! 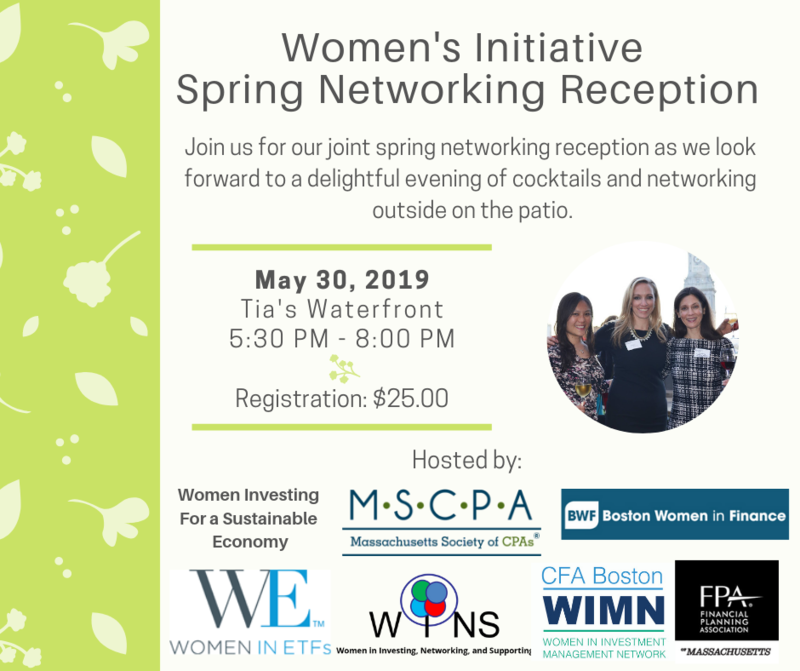 For questions or more information, please contact Boston Women in Finance at info@bostonwomeninfinance.org. I am an executive coach and leadership development specialist working with individuals and teams to develop strategies for successful careers and balanced lives. I bring 25+ years of corporate and higher education leadership experience to help managers and executives optimize their professional presence and skillset to achieve positive and successful results. As a coach, I partner with clients in a straightforward manner to enhance career potential and smooth transitions while considering the whole person and the passions that drive excellence in life and work. My approach is grounded in experience in several industries and professional training in leadership and coaching. Prior to becoming an executive coach, I was the Director of Executive Education at Bentley University where I launched the business unit and excelled in designing innovative leadership development and business programs for corporations and small business partners as well as teaching Global Strategy. As a former General Manager in the energy industry, I led finance and marketing business divisions through industry change and deregulation. I am a seasoned leader with proven results in creatively launching new business units, redesigning existing processes within established operating units, and looking for new solutions. My depth of experience in strategy, finance, marketing and leadership development provide a broad and unique perspective to her coaching practice. I bring a tangible understanding of the challenges of leading organizations through change and shaping strategies to make progress. To register for this program, please go here. 12 Dec 2018 Sip, Save, & Style! Holiday Networking with Boston Women in Finance! 06 Feb 2018 LAST CHANCE TO REGISTER The New Tax Bill - How Does it Affect You? 10 Mar 2016 Networking and Pairing: Women and Whiskey!! 16 Dec 2015 Work-Life Balancing Act: What is Your Definition? 06 Jun 2013 eMakeover: Optimize Your On-Line Profile ~ SOLD OUT! 08 Jan 2013 Can Being a Better Employee Make you a Better Manager?